via Oh by Gosh. It’s California Lavash! Do you love Thanksgiving dinner but aren’t up to cooking it more than once a year? California Lavash to the rescue. Here is a quick, fun and easy way to enjoy turkey and all the sides without spending the day in the kitchen. Extra bonus: There’s very little clean up! This wrap contains turkey and cranberries. It also has kale for the green vegetable. The fried onions are a blast from the past for everyone’s favorite green bean casserole. Finally, the Lavash is like the rolls. You get a taste of an entire Thanksgiving meal in every bite! Move over sandwiches. Wraps are here to stay. Just spread out all of the ingredients on a flatbread, roll it up and slice. Instant elegant sandwich! 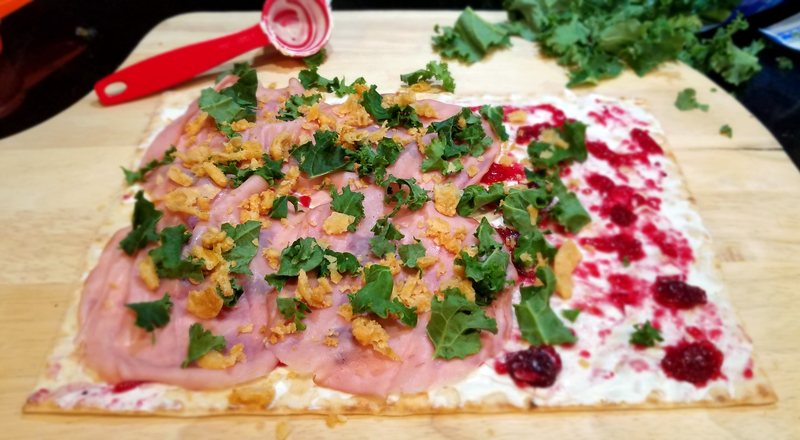 Enjoy this delicious Turkey Cranberry Wrap year round. Spread the whipped cream cheese on the Lavash. Spread the cranberries over the cream cheese. Put the turkey slices on a third of the Lavash. Sprinkle the kale and then the fried onions over the turkey. Starting at the turkey end, tightly roll up the Lavash. Cut into 7 slices. 7 pieces. 49 calories/piece. 8 grams of protein. If desired, more turkey can be added for more protein without many more calories. Tip: The wrap is best consumed the day that it’s made, because the fried onions will get soggy. I created my own recipe, but for more recipes, go to www.californialavash.com. This post is sponsored by Atoria’s Baking Company, who gave me California Lavash flatbread to try. Yeah California Lavash! I tried California Lavash flatbread for the first time and enjoyed it! As a newbie to flatbreads, I found it to be soft and delicious. It is excellent for wraps, pinwheels, flatbread pizzas, made into chips, tuna melts and paninis for breakfast, lunch or dinner. I like that it’s a family-owned bakery committed to using quality ingredients. Their breads are vegan, non-GMO and don’t contain artificial preservatives. I tried the Traditional Lavash and also the Whole Grain Lavash, which is a good source of fiber containing 4 grams per serving. FYI: Since their breads don’t have preservatives :), store them in the freezer to keep them fresh. They thaw on the counter in a few minutes. Purchase California Lavash in the bread aisle at stores like Safeway, Whole Foods, Sprouts, Smart & Final or delivered by Good Eggs. For a store near you go to http://www.californialavash.com/store-locator. February is Heart Month. Are you prepared? What should you do? Realistically, what you do in February is what you should be doing the other 11 months. It’s all about your health and taking care of yourself. Eat healthy. Eat plenty of fruits and vegetables to reduce your risk of heart disease. Half of your grains should be whole grains. Choose lean sources protein. Don’t forget to get enough calcium in your diet to help lower blood pressure. And what about those heart-healthy omega-3 fatty acids? Naturally, you can eat fatty fish two times a week. Be physically active 30-60 minutes a day. Your heart is a muscle. Exercise it to keep it strong. Cardio is an excellent way to lower blood pressure. Maintain a normal weight. Excess body weight can contribute to elevated blood pressure and blood cholesterol. Maintain a normal blood pressure of no more than 130/80. – Maybe invest in a blood pressure cuff to hold yourself accountable. Get regular blood work done and keep an eye on your cholesterol levels. You can’t feel elevated levels. If needed, take medication. It will save your life. Control stress. 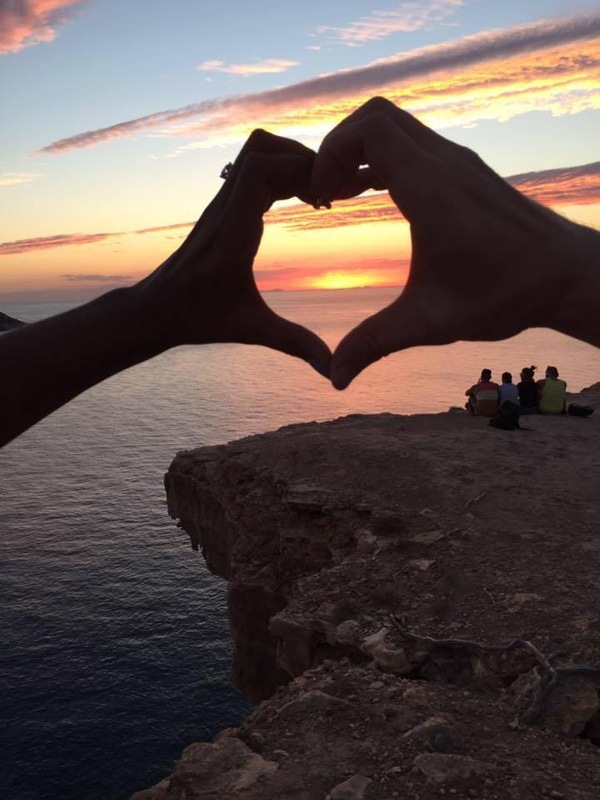 If you have suffered from a “broken heart”, give yourself a break. Yoga and mediation have been around for centuries for a reason! It works! Take a class. Go online. There are plenty of resources. Put Your Best Fork Forward with National Nutrition Month! 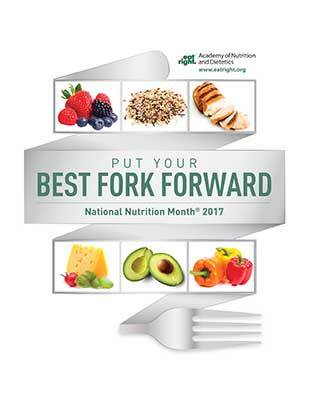 It’s time to “Put Your Best Fork Forward” to celebrate National Nutrition Month! Every March is a reminder to commit to healthy eating and physical activity. What can you do to change or improve your habits? Small changes add up over time. Change one habit at a time for long-lasting results. Would you like to lose weight? It’s not a diet. It’s a lifestyle. For motivation, check out Day 1 Motivation, Motivation, Motivation in The Food Is My Friend Diet. Would you like to include more fruits and vegetables in your diet? Add a fruit with breakfast. Add more veggies to a sandwich at lunch. Eat a fruit for an afternoon snack. Make half the plate a big salad for dinner. Would you like to be more active? What do you like to do? Walk? Go to the gym? Jog by yourself? Join a running group? Clean house? Dance? There’s something for everyone. A healthy lifestyle prevents health problems before they start. Who wants to take a lot of medications or spend time in the hospital? Do you spend a lot of money on coffee drinks and snacks? Go grocery shopping on the weekend to buy healthy snacks, such as popcorn, bags of nuts, string cheese, yogurt or fruit. Try cooking more at home. Begin with a meal plan for the week. When you have a plan, you will be less tempted to grab something quick on your way home from work. Besides, eating at restaurants can load on the calories, as well as extra amounts of sodium to your meals. Your goal is to create a create a healthy lifestyle that you are willing to do over your lifetime. For science-based experts that you can trust, find a registered dietitian nutritionist in your area. Check out www.eatright.org and be the best that you can be.